Why do some animals dump indiscriminately? Presented by Chris Smith, Dave Ansell, Emma Stoye. - Will the James Webb Telescope be able to see the lunar landing sites? Would the James Webb telescope be able to see the moon lander or some of the other man-made debris on the moon? Will the James Webb Telescope be able to see the lunar landing sites? - What image resolution will the James Webb telescope will capture? What is the resolution of the images that telescopes like the James Webb can capture? What image resolution will the James Webb telescope will capture? Well the telescope is in fact bigger than the Hubble Space Telescope. It's 6.5 metres, but it's designed to image in the infrared. Its images in the infrared will be as precise and as fine as the Hubble images are at the optical. So it will take as spectacular images as the Hubble does, but at infrared wavelengths. And so, for the first time, we'll see the universe in the infrared with the clarity and spectacular image quality of the Hubble Space Telescope. The size of the cameras is actually very large. We've used the latest infrared ray technology and one of our prime cameras, called the near infrared camera - not very imaginative I'm afraid - will actually take instantaneous pictures which are roughly 33 megapixels in size. So we'll get very large images. - What would NASA do with the equipment that's already been made if congress cuts the program? What would NASA do with the equipment that's already been made if congress cuts the program? It is certainly one of the worries. The greatest tragedy here is that the mirrors, which are the most complicated part of telescope, are in fact completed. So we now have, at the space flight centre here, all 18 mirrors, each one as precise as the Hubble Space Telescope, in boxes waiting to actually be assembled into a telescope. The UK, for example, is producing something called the mid-infrared imager and it actually will be arriving here soon. So we will have these instruments also ready to go. It's precisely because we have got so far with this that there's lots of rethinking going on about whether it was the right decision taken by the House - in the US system, there's the House and the Senate that decide on funding. The House first voted to actually not fund the James Webb Telescope. The Senate has yet to speak on the issue and I think people are beginning to scratch their heads and think, "Hold on a minute. We've got all this hardware. Is this the right moment to actually stop the funding?" A completely computer-generated model of the human heart that can successfully predict the effects of anti-arrhythmic drugs has been developed by scientists in the US. Irregular heartbeat, or arrhythmia, occurs when there is abnormal electrical activity in the heart - if the electrical pulses among heart cells get out of sync the heart can't contract and beat normally. Drugs used to treat arrhythmia act on heart cell membrane channels to alter the flow of charged molecules called ions, which cause the electrical signals. At the wrong concentrations, these drugs can actually make arrhythmia more severe, or even lead to sudden cardiac death. Thorough testing is therefore vital to determine the doses at which they are safe to use. 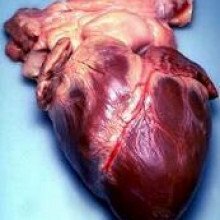 Traditional methods of testing (using animal hearts or human clinical data) are incredibly inefficient, but Professor Colleen Clancy and her colleagues the University of California have come up with a completely different approach: a computerized model of the human heart. In the model, mathematical equations represent the opening and closing of ion channels in individual cell membranes. Other equations connect these events among single cells in order to simulate a whole heart. Drugs can then be mathematically 'fed' into the framework and their effects monitored. Two existing anti-arrhythmic drugs - lidocaine and flecainide - were tested in this way at different concentrations, and remarkably the model's predictions were validated both by human clinical data and with similar tests on a rabbit heart. This novel approach could potentially speed up the drug development process, helping treatments get to patients faster. Professor Clancy said, "Our plan for the next phase of this work is to expand this approach to cover all the existing classes of anti-arrhythmic drugs and develop a database. Our long term goal would be to scale this up so it could be used in a high-throughput manner to screen drugs that are currently in development." The research was published this week in the journal Science Translational Medicine. Bacterial antibiotic resistance genes have been discovered in soil frozen for over 30,000 years, Canadian scientists have shown. Working at a site close to Dawson City in Yukon, Vanessa D'Costa and her colleagues drilled 6 metres into the permafrost to recover core samples from soils aged by carbon dating to concide with a time when mammoths and bison roamed the area. Using sensitive genetic techniques the team were able to recover from the samples DNA sequences of trees, animals and microorganisms. 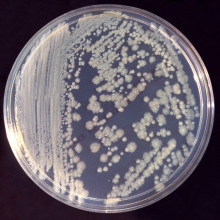 Focusing on the bacteria, they were able to identify the genetic signatures of a range of microbial species, including genes known to confer resistance to several classes of modern day antibiotics. The VanX gene that enables bugs to evade vancomycin was one, the TetM gene, which provides tetracycline resistance also turned up, as did the beta-lactamase gene that breaks down penicillins. The scientists ruled out contamination of their core samples by contemporary organisms by first spraying their drilling equipment with a strain of E. coli into which a glowing-green jellyfish gene had been inserted. By looking at the levels of this gene amongst the DNA they recovered from the cores they could gauge the level of contamination, which was extremely low. To confirm that the ancient anti-antibiotic genes were functional, the VanX gene recovered from the cores was inserted into a strain of laboratory-grown E. coli bacteria, which made the gene product. This was further tested to confirm that it behaves identically to the VanX resistance genes found in hospitals today. So, far from being a new phenomenon that has emerged only in the last eighty years over which antibiotics have become mainstream, antibiotic resistance is in fact much older. As the researchers say in their paper in the journal Nature, "This work firmly establishes that antibiotic resistance genes predate our use of antibiotics and offers the first direct evidence that antibiotic resistance is an ancient, naturally-occurring phenomenon widespread in the environment." This is because, after all, the antibiotics we use in hospitals today are largely "borrowed" from other microbes, which normally make these chemicals to protect themselves. Naturally, other bugs have evolved defense measures in the form of resistance genes. "[this] predicts that new antibiotics will select for pre-existing resistance determinants that have been circulating within the microbial pangenome for millenia. The reality must be a guiding principle in our stewardship of existing and new antibiotics." Tiny gold rods may give us almost complete control over light waves. Scientists have unveiled a way to control light beams, wave-by-wave. 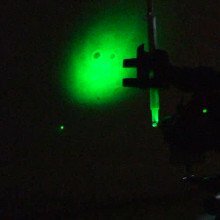 Light is vitally important, not only in our everyday lives to avoid bumping into things, but to our technology, ranging from transmitting our phone calls down optic fibres to making computer chips. So any improvement in our control of light should help in all sorts of different ways. Light will travel at right angles to its wave fronts, a wave front is the line along the top of a wave). Normally you do this with a mirror, or by using a material that slows down light like glass, allowing you to bend the wavefronts and therefore light in lenses or prisms, but this is very limited in what you can do with the light. Federico Capasso and collegues have managed a much finer control, they have managed to make tiny gold rods onto a silicon wafer that are smaller than the wavelength of light, which when they are hit by light have electric currents induced in them which slosh up and down the rods. Depending on the shape of the rods, these currents interact with the light and can slow down the wave fronts by different amounts. This means that the wavefronts can be controlled by changing the pattern of rods. They have made light leaving the silicon bend in a direction they can control, and they have made the light form a spiralling pattern by creating a circle of different rods with different delays at different angles. This spiralling light will cause molecules it hits to spin and is useful for controlling individual atoms or even cells, and in quantum computing. 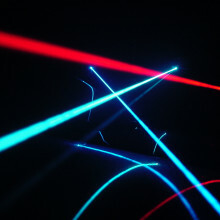 But the real power of this technique is that they have managed to produce a generalised form of the equations of reflection and refraction which will allow them to have almost complete control of light, so it should be possible to make patterns on a scale smaller than light's wavelength, completely flat lenses, perfect absorbers, and may other useful devices. Though it might be a while before they get used in glasses, as the present design will work differently for different colours. Chris - Researchers from University College Cork and McMaster University in Canada have found that the so-called good bacteria, also known as probiotics, don't just affect the digestive tract. They can also affect mood and potentially have an impact on stress and depression. Joining us now to discuss how they've down this work and what they've discovered is Professor Paul Forsythe and he's at McMaster University. Hello, Paul. Chris - So first of all, what was the question you started out by asking when you were doing this work? Paul - Well, over recent years there's been real increase in our understanding of the importance of the normal bacteria in the intestine, the gut microbiota, and how it influences a range of physiological systems. What particularly interested us was evidence emerging that these bacteria could influence the brain and brain development. We've been investigating the particular bacteria that we used in the study for some time, and we had demonstrated it could actually alter the activity of nerve cells in the intestines of mice. But what was really interesting is we could actually reduce the perception of pain signals coming from the gut and we took that as a good indication that it was modifying the communication between the gut and the brain. So we wanted to explore this further and to see if we could actually detect changes in brain neurochemistry and subsequently whether these changes in brain neurochemistry might alter the behaviour of these animals. Chris - So the bacteria that go into the intestine in some way change the chemical environment in the tissue of the intestine, which in turn changes the activity of the nerve cells in the intestine. You're saying that can then be propagated, or at least you speculated that it could be propagated, up to the brain and, in turn, alter neurochemistry in the central nervous system? Paul - That's it and actually what we demonstrated was that the Vagus nerve, which has already been and shown to be an important communication system between the gut and the brain, was critical to mediating the signals from the bacteria to the brain. So when there was no signalling going along the vagus nerve we didn't see the changes in the brain when we fed the bacteria. Chris - So talk us through the experiment. You did this in mice. Paul - We did, yes. So we fed mice with a particular strain of lactobacillus, Lactobacillus rhamnosus, and we fed them for 28 days. We then conducted a number of behavioural tests looking for things like anxiety and then we looked at the brains of these animals. We initially focused on the GABAergic system in the brain and so we looked at receptors for the neurotransmitter GABA and we saw changes in these receptors in the brain. Chris - Which bits of the brain did you look at and which bits of the brain showed those changes? More critically, were they the bits of the brain that would be consistent with the observed behavioural effects you saw in mood, stress, depression, that kind of thing? Paul - We did. So, we focused on the hippocampus and the medulla. They have both been related to changes in things like depression and anxiety. So, the changes we saw were consistent with the sorts of changes we were getting in behaviour - so reductions in anxiety-like behaviour. Chris - So how do you know that the link in the chain was gut to nervous system i.e. Vagus nerve to brain? How did you rule out the fact that the animals weren't just feeling better and healthier because they have these bacteria in their guts, and this was impacting on their behaviour? Paul - So what we actually did is we divided [cut] the vagal nerve so there was no signalling going from the intestine to the brain through the vagus nerve. We lost the behavioural effects and lost the changes in the brain chemistry, indicating that this signal through the Vagus was critical. And animals that were fed with just broth without the bacteria, they had no changes in their behaviours at all. Chris - So that's pretty encouraging isn't it? It shows that there is definitely some kind of connection going on - via that Vagus nerve - between the gut and the brain. You only looked at one nerve transmitter chemical though, and there are many others in the brain. Are you now going to go ahead and look at some of the other, what we know are mood-related, nerve transmitter chemicals and see if they also get changed? Paul - Exactly. I mean, we focused just on the GABAergic system in this study, but, as you said, there is a whole range of nerve transmitters involved. We don't know the extent of the changes caused by feeding these bacteria and that's definitely something we're actually looking at, at the moment. Chris - And what about in humans? 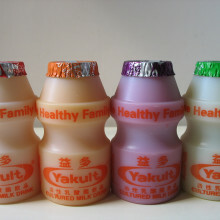 Is there similar clinical data that it has the same effects when humans consume these bacteria in the yoghurt drinks and things? Paul - The studies in humans are very limited and tend to be looking at reducing anxiety or chronic fatigue and things like that. But the studies have been quite small and the data is limited, so we don't really know what the effect of these bacteria would be on humans. That's obviously something that we want to look at. Chris - And of course related to that is what actually are the bacteria doing to have that effect in the gut itself, and is there some other way of mimicking their presence, or mimicking their effects? For instance, if you ate something different, would that have the same sort of impact on the gut as these bacteria do? Paul - Sure, exactly. I mean, looking at the bacteria itself, so what are the characteristics of that bacterium that allow it to mediate these signals? Is it something to do with the cell wall of the bacteria, or is it a product that that bacterium produces. And then how does it transmit the signal to the Vagus nerve? Does this involve other cells in the gut - immune cells perhaps - or is it a direct effect on the nervous system? And then we're also interested in looking at what's the nature of the change of the signal along the Vagus nerve that mediates these effects. I mean, it's interesting to note that electrical stimulation of the Vagus is actually an approved treatment for depression. And so it's quite encouraging that it seems our bacteria are acting on that same signalling pathway. Chris - Alright. We must leave it there. Thank you, Paul. I think it's very good proof that you are, genuinely, what you eat. That was Paul Forsythe. He's an Assistant Professor in the Department of Medicine at McMaster University and he's published that study he was discussing, this week, in the journal PNAS. Meera - Scientists studying how forests develop have discovered a new source of nitrogen that plants and trees can tap into, helping to boost their growth and so remove more carbon dioxide from the atmosphere. Benjamin - It was thought for a long time that the way nitrogen comes in to our environment is from the atmosphere only, and especially by way of a couple of interactions. One interaction involves bacteria known as Rhizobium and, in addition, nitrogen can come in from rain water. But it turns out that there's a tremendous amount of nitrogen that's in rock material. This is kind of a new discovery that nitrogen actually is in the rock material and it's also available to forests and other types of plant ecosystems. Meera - This new source of nitrogen is released by the rocks as they erode according to the groups paper published in Nature this week. More nitrogen, which is an essential ingredient for the formation of proteins and DNA, means that plants and trees grow faster, storing more carbon dioxide from the atmosphere as a result. The findings could therefore be used, say the scientists, to identify fertile areas in which to site forests intended to function as carbon-offset schemes in the future. Using mobile phones to track how people move about in emergencies has enabled scientists to develop better ways to target aid to where it's most needed. 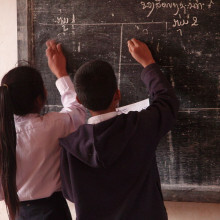 Although relief agencies have contingency plans in place for tackling a range of disasters, the way victims actually behave under these circumstances remains poorly understood. Linus - What characterises a disaster is often total chaos and it's very, very difficult to understand where people are. Since we know which tower each mobile phone used, we can sort of follow each phone as it travels across the country. We could see that approximately 600,000 people left Port au Prince 19 days after the earthquake. So, our hope is that this will contribute to making aid delivery much more efficient. A DNA-based "circuit" that "trips", and kills cancerous cells, has been engineered by scientists at the Swiss Institute of Technology and MIT.Described this week in the journal Science, the new system looks for specific microRNA molecules that are known to be present at higher-than-normal levels within cancer cells. Yakov - If we think about what would be the ideal anti-cancer therapy, it has to be something that looks at each cell and determines whether it should be destroyed or should be left alone. We don't have any good ways right now to do so. I think our study shows how to look inside the cell and detect what's going on with the cell with high precision, based on the integration of multiple cancer signals and markers. 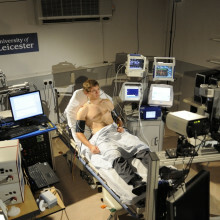 A team of scientists at the University of Leicester have used space technology to develop a "Star Trek" style "sick bay" that can non-invasively detect a variety of illnesses, all at once. Paul - The first uses imaging technology, which has really been developed for use on the Mars rovers, to look at the colour of people's skin for instance, to see whether we can pick up disease from that. The second suite of technology looks at the composition of people's breath. From that, you can actually tell how well people are. The third suite of monitors really looks inside the body, but non-invasively, to look at blood flow and how much oxygen is in the blood and muscles and skin at any given time. Put together, it's the first time that you'll get this holistic measure of a patient's well-being. Meera - The whole diagnostic process should take just 15 minutes. and will be based at the Accident & emergency department of the Leicester Royal Infirmary, which sees 150,000 patients coming through its doors annually. 22:27 - How do fish survive in salty and fresh water? How do fish survive in salty and fresh water? This ability to regulate like this is called "osmoregulation", and all fish can osmoregulate. Some fish that live in a saltwater environment, and only live in a saltwater environment, such as tuna, drink the very, very salty seawater. Their kidneys are specially adapted to excrete lots of salt, and even their gills can excrete salt in this way so that they keep their blood salinity levels at an optimum. Freshwater fish are the opposite. Water constantly moves into their bodies from the water so their kidneys excrete lots and lots of water and their gills do also. 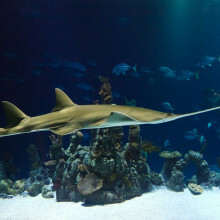 But, critically, they manage to hang on to salt to keep their blood at the right salinity. But then you have these odd fish called "euryhaline" fish - like salmon, eels and striped bass - and they have to be able to tolerate huge changes in outside salinity, either because of their life-cycle, like the salmon, which goes upstream into freshwater to spawn, or if they live in an environment like an estuary where the river meets the sea. They're capable of switching from one kind of osmoregulation to another and these sorts of large regulatory changes are controlled by switches in their brain. But it's worth mentioning, they still need quite a bit of time to acclimatise to new salinities while these regulatory mechanisms are switching over. Chris - Do you think the fish therefore change their behaviour? So if they're swimming down an estuary, would they just naturally adapt because it takes time to swim all the way down the estuary and the water is going to get more and more salty as they do it, or do they loiter in a certain area and expose themselves gently to the rising salt so that they don't literally get a bit of a shock when they go from fresh to really salty? Emma - I don't know for sure but I should imagine that they "loiter" a bit so they can take the time to switch their system over to the new kind of salinity level. Chris - Now we have a very special extra guest who's with us this week and that's Dr. Matt Mountain. He's the Director of the Space Telescope Science Institute and he's been overseeing some of the groundbreaking work that's been done with the Hubble Space Telescope, as well as working on its successor the James Webb Space Telescope. He's with us to answer some of my questions, but also, more importantly, some of your questions this week, and to tell us a bit about the project. Hello, Matt. Matt - Hello there, Chris. Chris - First of all, can you tell us what is the James Webb Space Telescope? What will it do? 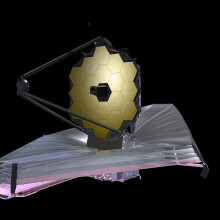 Matt - Well the James Webb Space Telescope is designed to be the successor to the Hubble Space Telescope. If you like, sort of Hubble 2.0. It's designed to work not as the Hubble is, at optical wavelengths, but actually at infrared wavelengths and it's much bigger than the Hubble. It's 6.5 metres across when the Hubble is only 2.4 metres across. It is a very big telescope, which actually has to unfold on its way to orbit. It's orbit is roughly four times the distance between the moon to us away, roughly a million kilometres away. It's designed to look at the very first galaxies that ever formed in the Universe's history and, we hope, look at planets that are orbiting other stars and actually perhaps detect for the first time liquid water on those planets. Chris - How was it conceived and how is it being constructed and how far along are you? Matt - It was conceived by people at the Space Telescope Sciences and by the astronomical community in the US generally and now in Europe. As the Hubble started work, we began to understand the limits of what we would be able to see with the Hubble. For example, we began to understand there was actually a whole class of galaxies - very early galaxies - that the Hubble could only barely see. It could see the sort of peak of the iceberg and there's a whole sort of hidden Universe in the infrared which in fact we called the "Dark Ages." It's the time from when the Big Bang and the background radiation, and the sort of irregularities in that radiation, turned into galaxies. Then galaxies appeared, and the galaxies that we see in the optical come from a certain point back in the Big Bang, roughly 13 billion years ago. But we know the Big Bang started 13.7 billion years ago, but that period in-between, these Dark Ages, was inaccessible. We realised that there was a very rich Universe there and we needed a telescope that was much bigger than the Hubble that could operate in the infrared. So, it's been under construction for over 5 to 6 years now and each of its mirrors are part of a hexagonal segment. It's rather like a ground based Keck telescope, which is a very large telescope in Mauna Kea in Hawaii. This telescope is made up of segmented mirrors that all have to operate as a single mirror. It's a very radical design and it will be flying far beyond the moon at a point called Lagrange point 2, which is a sort of stable point beyond the moon. There it will cool down to a ridiculously low temperature, roughly 40 degrees Kelvin, which, speaking from the US, is roughly minus 400 degrees Fahrenheit. So it can be very, very cold and where we are right now is that all the mirrors have had been made. In fact last week, they were completed. We have had some problems with cost overruns and some technical problems. We had to invent 10 new technologies to get this task going but we're hoping to get this thing launched by 2018. Chris - Yes, that's a bit of a sore point, wasn't it. Because if you look the history of the James Webb Space Telescope, it was conceived in, what - the mid-90s? It was supposed to be flying by the mid "noughties" and it was supposed to have a price tag of half a billion. That price tag is now nearly 9 billion. So, how optimistic are you that you will be seeing this thing returning data to Earth by that date? Matt - Well it was never actually supposed to - yeah, I mean you're absolutely right. There's a lot of controversy going on right now but it turns out that it was never supposed to be flown for half a billion Dollars. That was an estimate that people thought you perhaps could actually get something like this going if you launched it by sort of the late '90s. By the time people started studying this though, they realised that really something of this scale was going to cost between 3 to 4 billion Dollars if we could get it launched by sort of 2011. But delays and some of the technology challenges really have pushed the whole launch date out and as you push the launch date out of this very, very complicated telescope, the cost goes up. And on top of that, we then started actually realising we needed far more complicated instruments than had originally been put together. You stack all that up, and yes, you're looking at a price tag probably to get this thing launched of at least 8 billion Dollars, which of course is an enormous amount of money. But the Hubble itself, to get it launched in today's Dollars, cost roughly 10 billion Dollars. So for something of the order of the cost to get the Hubble launched, you're getting a telescope which is almost 4 times larger and incredibly more powerful and in a much more stable orbit than where the Hubble is. Dave - And, I mean, one of the first things you said was this thing has got to unfold - that immediately rings alarm bells for a telescope! You're trying to position your mirrors to within a wavelength of light - I guess, for a really good quality telescope - so that's got to be a serious challenge? Matt - Absolutely, and in fact when you first watch the movie (you can go to one of our websites and you can watch this thing unfolding) people do actually turn to you and say, "Are you kidding?". What they've forgotten of course is, on the ground for example, the 10-metre Keck telescope on Mauna Kea. It has lots of segmented mirrors, and it holds its figure perfectly in wind at all conditions on Mauna Kea. What we use is a thing called a wave front sensor where we actually measure a star from the mirrors and we measure the wave front and then correct, because each of these mirrors has an individual adjustment on it. so we're constantly adjusting these mirrors to actually have them line up as a perfect single mirror. That technology was in fact mastered back in the '80s by the Keck telescope on the ground. 35:48 - What determines the rate at which a planet spins? 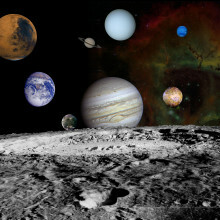 What determines the rate at which a planet spins? Well it's a very good question. The interesting part about this is how do you actually stop a planet from rotating? The way planets are actually formed, the only way planets can be formed, is in these very large spinning disks [around a developing star]. As young stars collapse [in on themselves as they form], they begin to to lose angular momentum and the dust clouds themselves are naturally spinning. It's much easy to make things spin than it is actually to have things stationary. So as the planet system forms, the disk spins faster and faster to lose angular momentum. The material can then form and fall towards the star, and out of this collapsing disk you get these sort of lumps and bits and pieces, which become planets. These planets are intrinsically spinning from the angular momentum of the overall formation disk. Then, as the planets evolve and as they begin to clear gaps and stuff, if they bump into other things these can either slow them down or in some cases even spin them up. It becomes a very complicated interaction. Sort of like if you spin a whole bunch of marbles in a bucket and just let them go, they'll all start bumping into each other. That essentially is what happens in the early planetary systems. At the end of all these process, as more and more material gets swept away and the planets become more and more isolated, they're basically left with whatever spin they last had at their last interaction. That could be the intrinsic angular momentum of the disk or angular momentum that they actually gained or lost as they bumped and smashed into each other. The moon is actually a very interesting case because this is what's called tidal locking. You can get to a certain point where, if you're spinning at a certain rate, the angular momentum of the Earth and the moon begin to interact and they can actually lock if they are the right distance apart and going at roughly at the right speed. This is in fact what happened with the moon. It became tidally locked with the Earth and is now rotating in this locked sense so that you only ever see one face of the moon at any one time. The only thing that will now change the rate of the moon is if something hits it. Well it will actually all begin to slow down a little bit because it's losing its angular momentum because the tides and the Earth are actually putting a little bit of drag on the moon's rate. 38:48 - Is Oxytetracycline related to tetracycline? Is Oxytetracycline related to tetracycline? Yes. They're both molecules which are structurally related to each other [and work to suppress the growth of bacteria via the same mechanism, which is by binding to the "A" sites in bacterial ribosomes and blocking the process of protein translation]. 39:01 - Where does all the rubber worn from tyres go? 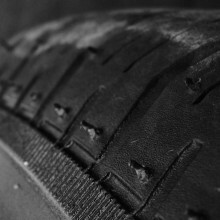 Where does all the rubber worn from tyres go? Dave - If you've ever changed a bicycle tyre you'll know where quite a lot of it ends up and that's all over your hands, because you're covered in a horrible black gunge which I think is mostly tyre rubber. Then what's going to happen to a kind of black powder all over the road, it's going to get caught up by water and washed away. I imagine that rubber is a natural thing so eventually, some of that could be broken down I'd thought biologically. Chris - It's vulcanised though isn't it, because it's got some sulphur added so it cross-links, making it harder to breakdown as it's been modified that way. I think it's quite persistent. Dave - Okay, it's going to be a very slow process so I would've thought most of it ends up in sediments in streams and rivers, and it will slowly get fossilised in there or at the bottom of the sea, where it will sit until it's degraded and turned maybe back into oil. Emma - One of the most promising technologies for tackling rising carbon dioxide levels in the atmosphere is known as carbon capture and storage. The idea is to trap carbon dioxide from power stations inside rocks rather than release it into the atmosphere. 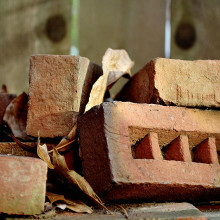 But what if, instead of just storing the carbon, you could turn it into something useful - like bricks? Planet Earth podcast presenter Richard Hollingham reports from the University of Nottingham for us this week on a new technique dubbed: Carbon Capture and Utilisation. Richard - They look like large boiled sweets or perhaps something you'd use to make gravy, but when you bang them together, they're as hard as bricks. Anthony Benham is Business Development Manager at the National Centre for Carbon Capture and Storage. Anthony - One of the experiments that we're trying to do here is to react carbon dioxide with naturally occurring minerals. In this reaction process you actually produce a new type of mineral that can effectively be used in the construction industry, for example, producing aggregates, and things like that. Richard - This process of combining carbon dioxide with rock turns out to be nothing new. Anthony - What we're trying to do is accelerate the natural process of weathering that occurs in the environment. So certain types of rocks react with the carbon dioxide that naturally occurs in the air and produce new minerals. This occurring in the normal every day environment is a very, very slow process. So what we're trying to do is accelerate that process; and in doing so, you produce these effectively OXO cubes of different sort of minerals if you like. So this one's quite a brown colour and we've got this one here which is almost pure white, it looks a bit like chalk. Richard - If you bump them together, the white one's quite soft, this brownish tan-coloured one, both of which fit in the palm of your hand, that one's quite hard so you can make different things out of them. Anthony - Yeah, that's right and the products that you get will essentially depend on the materials that you use at the start of the reaction. For example, we use a lot of silicate minerals here - magnesium silicates and calcium silicate minerals - and depending on the quantities that you use will partly determine the end products and therefore the colour that you get at the end of the reaction. Marco - So we close the cylinder over there. Richard - The reaction itself takes place in a sealed metal flask with a mixing paddle. It looks a bit like an industrial kitchen mixer. Richard - In the lab, researcher, Marco Drea talked me through the process which even sounds like it could be a recipe. Marco - We just mix our feed stock with the CO2, so we mix them together and we produce our final product which is the mineral carbonate. Richard - But at the moment that final product isn't very big, even though each domino-sized tablet contains three litres of carbon dioxide, you'd still need a lot of these tablets to make even a single house brick, let alone a house. Mercedes Maroto-Valer is the Chief Scientific Officer for the National Centre. Mercedes - Yes, you are absolutely right. We need quite a few of these to actually build a house. These are just demo pieces that we build because they're easy for us to take around and it is easy for people to think about these as something that the CO2 has been solidified into and now they can walk out the room with this on their hands or in their pockets. But you are right, we need to scale up the process and we are currently involved in a series of projects looking at scaling up, so actually we can see the potential and feasibility of the technology in the UK. Richard - How would this work in practice? Would you have a brick plant next to a power station? How would this work in practice, if it did work? Mercedes - That's one of the things that we are now involved in in a project together with the Energy Technology Institute, Caterpillar, and also Shell; and what we're looking at is the feasibility of this technology in the UK. So we will be able to see in which locations it makes sense to build plants that will actually take the CO2 and mineralise it. Anthony - We're looking at ways of accelerating the reaction using typical atmospheric pressures and temperatures and varying the conditions, and the concentration of carbon dioxide that you use, and the quantity of material that you use in the reaction because ultimately, if we are to produce this at a large scale then you want this to be using the lowest amount of energy that you can. 45:48 - How do liquids behave in space? How do liquids behave in space? Dave - It fundamentally depends on the liquid and where you are in space. 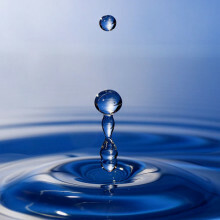 If you throw water out in space, about where we are in the solar system, what's going to happen is that any water that evaporates off it isn't going to come back again - it's a hard vacuum. So it's going to boil away and, as it does that, it's going to get colder. At some point it might freeze, but, eventually, it will still sublime and all turn into a gas. If you did the same thing where it's very, very cold, out near Neptune or something, then it would be so cold that it would just freeze. If you did get a bit of evaporation, it will cool down and freeze and essentially stay there as a lump of ice. If you use different liquids, different things will happen. Things like ionic liquids, they boil away so slowly that you could just have a blob of them them which sat around as a liquid permanently. Chris - And what about on the international space station, if an astronaut sort of had one of those burps that occasionally has a little bit of follow through, for example, or just squeezed his packet drink a bit hard, what would you see? Dave - So, if it's not going to evaporate then the major force affecting it is surface tension, the only force which is left. So essentially, you get a huge droplet of water which is kind of held together by surface tension that would bobble around and just sit there floating in space until he'll either drinks it or it hits something. 47:17 - Are 'pins & needles' damaging? Are 'pins & needles' damaging? Well, pins and needles occur when there's too little blood flow to a nerve or when a nerve has been damaged. The fancy name for pins and needles is parasthesia and what's actually happening is that you don't have enough blood flow to a nerve, or you squeeze a nerve. What happens is that the blood which is supplying the nerve comes from tiny blood vessels in the wall of the nerve, so the pressure closes those vessels off. Nerves have an extremely high metabolic rate. They consume energy faster than almost any other tissue in the body, so if they don't have a regular blood supply then they cannot keep themselves charged up and active. So they start to deactivate and the first fibres to deactivate are the ones that are the smallest and those ones are the ones that subserve pain. So that's why you feel these little jagged pin prick type sensations because the nerves stop firing normally and they start to either discharge spontaneously, or the cells in the spinal cord that respond to them just start to fire off spontaneous nerve impulses because they can't hear the signal coming in from the nerve that's been squashed or deprived of its blood flow. That's why you get the pins and needles. As long as you move your arm quickly or your leg, or whatever body part to restore the circulation to it, it goes away very, very fast. Except...this can be a big problem in people who fall asleep drunk on a Saturday night with their arm over the back of a chair. This is called Saturday night palsy because, in these individuals, they actually squash the nerve in the arm and the blood vessels there. As a result the nerve actually never recovers and they can end up with this Saturday night palsy and you get a limp arm that dangles; not terribly helpful! 48:54 - What loses heat fastest, a white or black surface? 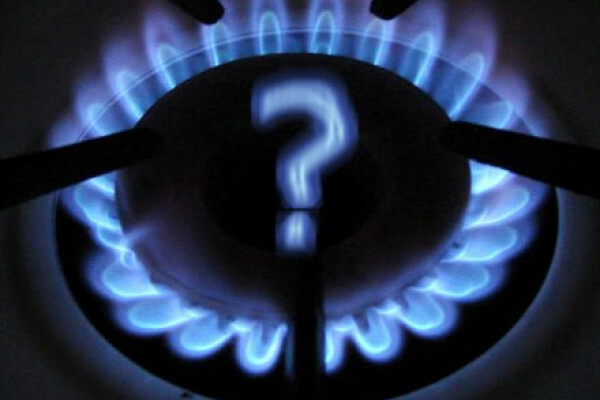 Does a black object emit thermal radiation more readily than a white object? What loses heat fastest, a white or black surface? Dave - To really understand what's going on here, you want to understand how light is emitted and absorbed. Essentially, when light is absorbed, a photon of light comes in and hits an electron, giving it some energy. Now, whether it's absorbed or not will depend on the structure of the electrons [in the atom]. If there's somewhere for the electron to go, and if it can increase it's energy level, then it will absorb the light. If not, then the light can't be absorbed and carries straight on. If it is absorbed, the substance looks black. If it isn't, it's white [because the light is reflected back]. This means that, if you heat something up, if there's [a higher energy level] somewhere for the electrons to go up to, and it's black, then there's also somewhere for the electron to drop down to again, meaning that the substance will also emit energy. So if something is good at absorbing light then it's also good at emitting it. So a black thing should be much better at emitting light than a white thing. Chris - So if you have solar panels on your roof, for example, that are heating water, you don't want the water going through them when it's colder outside than the water is because you're turning them into very effective giant radiators? Dave - That's right. And if you want to cool down a spaceship, the only way of doing it is by radiation of infrared light, so you paint the outside of your spaceship, or the bits of the radiators, in really dark black, which is so much better at emitting the light a much better radiator. Chris - Alright; slight twist to the story: if you're a cricketer and your at Lords, assuming it is sunny on the occasion you're over there - not that we've been having much sun lately - they wear white, ostensibly to reflect the heat back off. So would they be better off wearing black then, assuming they're going to get hot anyway, so they can radiate the light and the heat better with the black surface? Dave - They're very, very unlikely to be hot enough to be radiating more heat than the sun is putting down on them because the sun has got a kilowatt per square metre and you're going to have to be very, very warm before you're emitting that much heat. So, I think you're still better off being in white. 51:07 - Why do some animals defaecate indiscriminately? Why do some animals defaecate indiscriminately? Emma - Right. The answer is actually rather messy, if you forgive the pun, because there isn't a definitive answer and I don't know if there is zoological term for animals that just go whenever and wherever versus those who can hold it. I think it's just termed bowel control or lack of bowel control. Whether an animal goes everywhere or they go off to do it somewhere specific depends on the nature of the poo itself, which might be dependent on the food that the animal eats. It tends to be that very non-toxic vegetarian poo, which is no harm to the animal at all, can be done wherever and there's no danger to the animal being around that poo. You'll definitely notice if you have rabbits or guinea pigs that they just poo all over the place. In fact, guinea pigs even eat their poo, which is really disgusting to us but great for the guinea pig because it gets an extra meal. In comparison, animals with more nasty, parasite laden poo tend to go off and poo somewhere else. Horses in a field tend to poo in clumps and they never feed around that clump so the grass gets really long. They do this because they can have some really nasty kinds of worms and parasites that get inside them if they ingest anything which lives in their poo. Birds as well, you'll notice, always have clumps of poo below the bird's nest, but they don't intend to pooh in their nest. In fact, some birds actually remove poo out of their nest and carry it off and drop it somewhere else. That's thought to be to do with the parasite burden. Another dimension to this is actually communication. You'll know that many animals communicate using smell. Big cats such as cheetahs or lions out in the savannah tend to poo out in the open deliberately to mark their territories. In fact, that's often how they're tracked. Hippos use their tail to actually swirl poo around in the water where they go, again to mark their territory [and to flick it into trees and shrubs on land, for the same reason]. As you mentioned in the question, being caught as a sitting duck and not wanting to be caught by predators, that could also have something to do with it. So again, horses and animals such as deer can definitely poo while they're actually running along. So I should think that's useful. I hope that answers the question. 55:12 - How do new neurones develop? How do new neurones develop? Scientists discovered, much to their surprise about 15 years ago, that, contrary to prevailing wisdom, nerve cells in the central nervous system, in other words the brain and spinal cord, are actively dividing into adult life. 62:44 - Why do wet dogs smell? 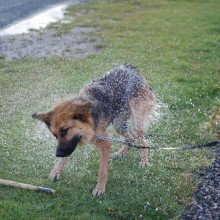 What is it that gives a wet dog that distinctive smell? Why do wet dogs smell? Next How do electrons orbit in atoms?